I just finished reading “Hospital Sketches”….. I can’t tell you how much I loved it. I laughed straight through the first two chapters (where she described her journey to the hospital) and then cried through the hospital scenes…. Louisa’s writing is an enigma to me. How she can write with both dry humor and aching warmth at the same time baffles me. Critics say this is when Louisa found her true voice, in realism. Hospital Sketches is a wonderful book filled with her sharp humor and poignant remembrances. I’ve stated a few times on this blog that some of her best writing is about death because she was not afraid to stare it straight in the eye and embrace the profound truths it reveals. Louisa’s writing gift was not so much artistry as it was a well-honed craft; she had an amazing ability to adapt to different genres. 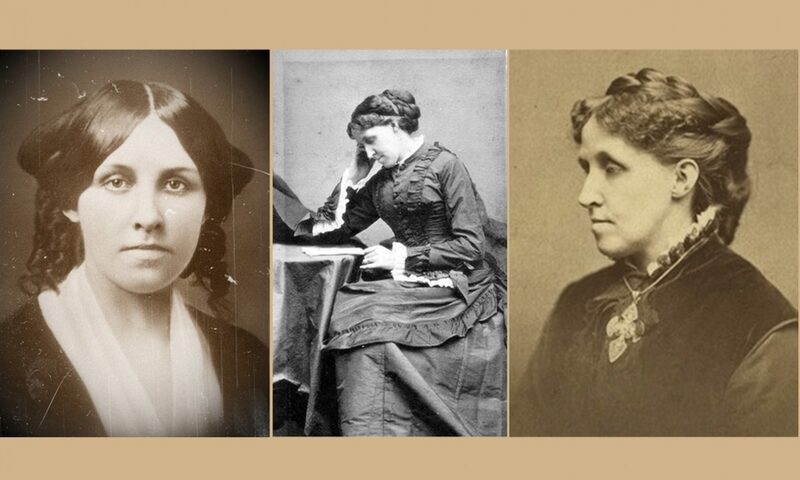 I would highly recommend that you read Madeleine Stern’s Louisa May Alcott A Biography – there’s a link to where you can find it on Amazon on the My Growing Library page of this blog. Glad you so enjoyed Hospital Sketches! I haven’t read the Stern Bio yet, but it’s the next one. I’ve read “The Woman Behind Little Women” and “Eden’s Outcasts”– both of which were terrific (although neither of them made me think very highly of Bronson Alcott). I doubt there will be any bio that will do that! At best, he is one complicated dude! What if Beth March had lived? Read “Concord,” an e-book by Ginger Rapsus, available at Amazon. We just visited the Fruitlands Museum and I am interested in sharing some more information about it with my kids. I found the book Becoming Little Women which I think would interest them but am curious what specifically it addresses in the book that you mention in your review as too current and adult. I’d appreciate any info you can provide. I stumbled across a very cool book online last year. It’s called Little Women Letters From the House of Alcott and it’s a compilation of some of the Alcotts’ journal entries. The book was put together by Jessie Bonstelle and Marian De Forest. Have you seen or read this book? It really let’s you see into their lives and minds. I don’t know of too many books featuring the Alcotts’ words other than those from Louisa May. Anyway, I really enjoyed and I hope you enjoy it as well! I have read that book and I love it! Were you able to read a hard copy or did you read it online? I loved all the illustrations in it – that’s one book I would love to add to my collection. I know it’s been forever since I wrote about this topic and I offer my apologies for forgetting and failing to respond. As to how I got the book I managed to find it online at Amazon (I think it was Amazon at least and found two hard copies there. Just discovered this site. and I am so glad! I sent an email, Susan. Please continue your good work! Welcome! So glad you’re enjoying the site. Hi! My mum found a copy of a book entitled “Little Wives” at a second hand bookshop the other day, and it’s the same text as “Good Wives” – we’re trying to work out if it’s just a case of different titles in different countries (like Philosopher’s Stone v. Sorcerer’s Stone in the Harry Potter Series), or if the book was released under different titles over time. Any ideas? What country did you find “Little Wives” in? Good idea that it could be a different title like in the Harry Potter series. It has happened before in countries around the world. Love this post! I got myself The Annotated Little Women and Little Woman in Blue for Christmas, read both over the holidays and am just “over the moon” with both, and especially with May Alcott. Her early death was a crying shame. She really is my favorite. She may have been like Amy as a preteen but it looks like she snapped out of it, as she even did in the book. I also wouldn’t be surprised if some of her very early artistic attempts didn’t fail, but becoming good at art takes lots and lots of practice. Don’t forget that during most of Little Women she was never over 18 or so. There is so much more to May than meets the eye and I’m glad that she was explored in Little Woman in Blue. I hope someday someone does a serious biography of her. It’s harder as you have to research her life in England and France as well as here.